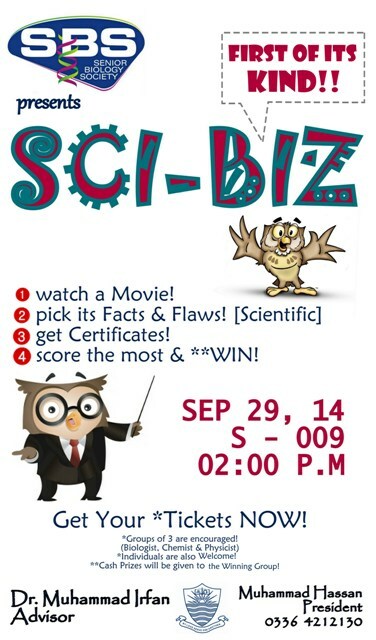 The Senior Biology Society presents a first of its kind event, Sci-Biz. This event will take place on Monday 29 September 2014. 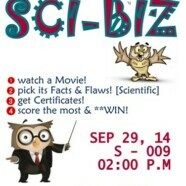 At Sci-Biz, participants will be shown a sci-fi movie and will be asked to identify scientific facts and flaws in it. A panel of judges, comprising instructors from departments of Biological Sciences, Chemistry and Physics will judge the arguments put forth by the participants. The wining group will be awarded a cash prize. Certificates will be given to all participants. Groups of three students, consisting of a student each from department of Biological Sciences, Chemistry and Physics are strongly encouraged to participate. Individuals are also welcome. Get your tickets now! Wonderful event, loved the concept!